Posted on June 13, 2017 by Matthew Mahalik. Models were becoming increasingly confident in the potential for one of the biggest severe weather events on record in Wyoming, so we were prepared for a long day of data collection. Teams got off to an early start after a discussion with forecasters from the National Weather Service Forecast Office in Cheyenne, and our early morning balloon launch showed conditions were indeed in place for several supercells. The first storm of the day fired right on schedule on the eastern slopes of the Laramies, north of Cheyenne. 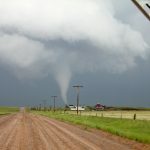 By the time it reached Interstate 25, it had developed into a supercell and would go on to produce several small tornadoes. However at the same time, a cluster of severe storms to the south had developed near Fort Collins, Colorado. It was a difficult decision: follow the isolated storm in very favorable conditions to the north (away from our initial location), or let several organizing storms come to us, moving into the more favorable environment. We ended up staying south where there were more deployment options. Our initial target intensified directly over Cheyenne. A large wall cloud formed as we raced ahead of the suddenly strongly rotating supercell. 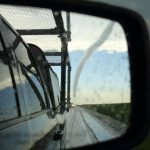 We began transecting the forward flank of the storm as it matured, encountering occasional hail more than two inches in diameter. 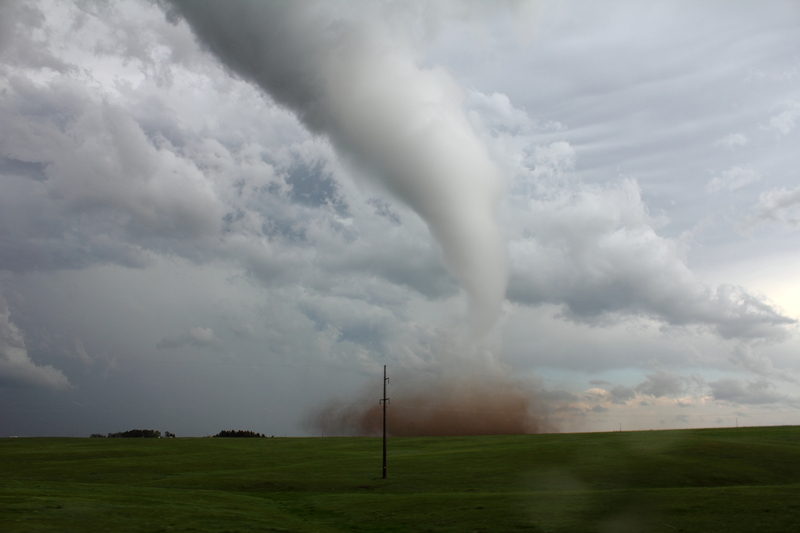 As we collected data, a tornado stretched and twisted as a second funnel developed, eventually reaching the ground. We moved to gain some distance ahead of these circulations. Then almost as quickly as the storm organized, it completely fell apart, becoming only a ragged band of clouds and rain within minutes. With the first storm dying, we turned our attention south. The other storms that had formed in Colorado were now a trio of rotating severe storms all in close proximity. Approaching from the northwest, we decided to first sample the western cell and then drift toward the stronger storms further east. This was the weakest of the supercells in the region but its mesocyclone was holding strong, and we performed a few transects near the updraft. From there, we moved toward the stronger, nearby storms. This repositioning put us in the precipitation for a while, but when we emerged out the other side, we had a pretty amazing view of three distinct mesocyclones. We had worked our way between the original two “twin” mesocyclones moving north from Colorado and a third had split from the easternmost one. We were heading south, with two mesocyclones to our left and one to our right, and all three were producing rotating wall clouds. At first, the westernmost storm was most active producing a brief multi-vortex tornado. Simultaneously, at the other end of the same wall cloud, a second funnel lowered and briefly touched down as well, before both disappeared. 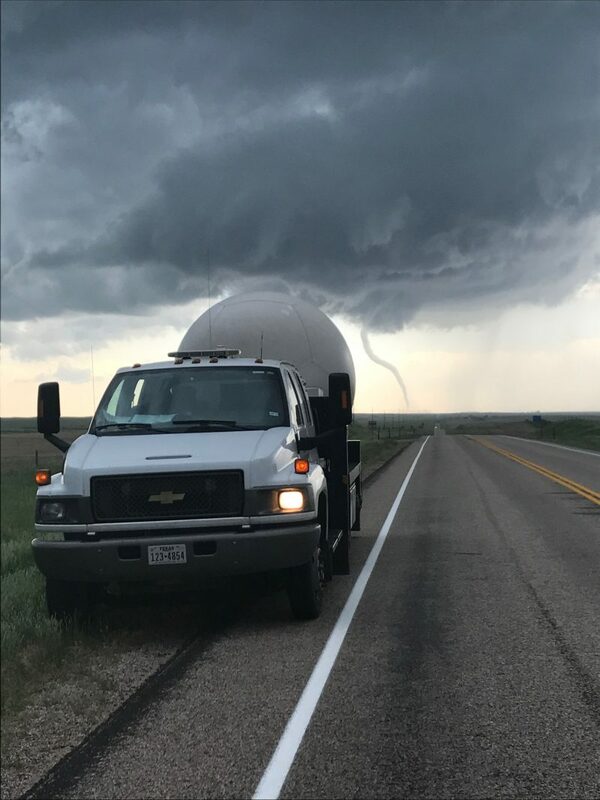 Two minutes later, on the other side of the road, a large funnel dropped and a large cone tornado formed on a hilltop, from the middle mesocyclone. 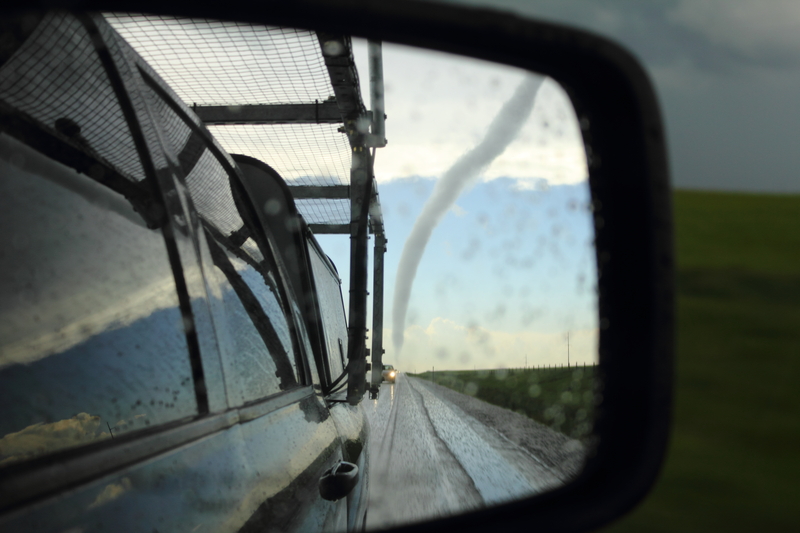 Amidst sporadic small hailstones, we continued to collect data between the large tornado to the left and yet another tornado to the right. 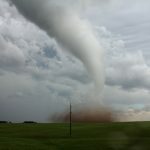 The larger tornado slowly roped out and dissipated as sporadic funnel clouds formed from the three wall clouds. My report to National Weather Service forecasters at this point was simply “occasional tornadoes all around” our location. The most significant tornado we encountered came from the middle mesocyclone after it had crossed into far western Nebraska west of Bushnell. From here, we were forced to drive southeast, away from the storms, for gas in Kimball, Nebraska. Our parting shot of the two western mesocyclones was another pair of white tornadoes against the dark precipitation core. This was the third and final set of “twin” tornadoes of the day. By the time we had resumed operations, the massive easternmost mesocyclone had become the dominant one. It was a messy mass of rain and hail with an intense vortex completely rain-wrapped and invisible. The storm provided little chance of safely collecting meaningful data. We followed it for a short time near Scottsbluff, but the huge storm never improved its structure. As the sun set, we declared operations complete for the day and headed east toward our hotel in Ogallala. We unfortunately encountered severe damage in the town of Bayard, which was later determined to have been struck by two separate tornadoes. This was a long, exhausting day. 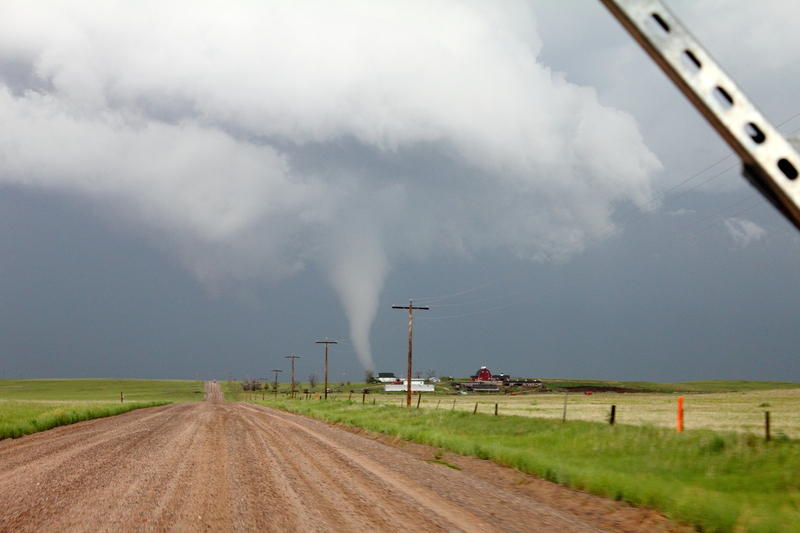 We made successful deployments on four supercells, three of which produced tornadoes. The final tornado count is unclear, but we encountered more than 10. Finally having data points from tornadic cases to compare against non-tornadic cases is a big step forward for the project.